Dr Peter Braun is a dedicated sport and exercise medicine physician. He has 29 years’ experience treating athletes of various sporting codes, from recreational participants of all ages, to elite professionals. His mission is to get you back to your chosen sport or activity, as quickly and reliably as possible. Whilst you are injured, he will advise alternate forms of training to optimise recovery and maintain fitness. Dr Greg Harris is a Sports Physician who has worked with elite and community sports groups including Richmond AFL Football Club, NT Institute of Sport, NT Mosquitoes Rugby Union team, AIS Cycling and Masters Games. 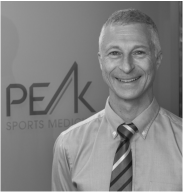 His professional interests include cycling, all football codes, tendon injuries, foot and ankle injuries, expedition medicine, winter sports and motorsport. Mr Andrew Ho-Peng is an Accredited Practising Dietitian with the Dietitians Association of Australian (DAA) and an Accredited Sports Dietitian with Sports Dietitians Australia (SDA). He consults in private practice and has worked for the Sons of the West men’s health program, in academia and with many sporting clubs. Dr Judith May is excited by the opportunity to assist all patients to good health through rapid return from injury, commencing an exercise program or improving fitness, strength and well being. 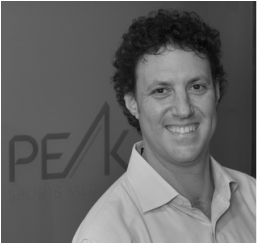 Dr Michael Giummarra joins Peak Sports Medicine as a Sport & Exercise Medicine Registrar in 2018. He has experience working in the NSWRL, VFL, and AFL TAC Cup teams. This year, as the senior AFL Victoria Medical Officer Michael looks after the Vic Metro squad, and is Team Doctor for Western Jets Football Club in the TAC Cup competition. Peak Sports Medicine has a long and proud association with the Jets, which we are thrilled to continue this season under Michael's leadership. The acute injury clinic offers an accessible acute injury service at short notice. Urgent appointments with Michael are available every Monday, to facilitate prompt attention.